Generation of micro-bunch trains with variable period opens an important area of applications, such as the resonant excitation of wakefields. An ATF user experiment demonstrated a stable train of micro-bunches with a controllable sub-picosecond delay [1, 2]. 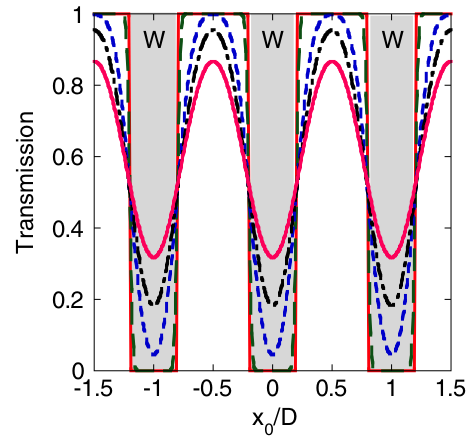 The train was produced by imprinting the shadow of a periodic mask on to a several-picosecond bunch with a correlated energy spread (see Figure 1). Figure 1. (a) Principle schematic of the mask technique; only the dogleg section of the beam line and two quadrupoles are pictured. (b) Train of bunches measured in the energy plane, configured for application in the PWFA experiment: five equidistant drive bunches followed by a witness bunch, with a separation one-and-a-half times that of the drive bunches. This picture was taken from the beam profile monitor located immediately downstream of the mask. where xw,i is the position of the ith wire for a mask with equidistant wires xw,i = iD, i = ..., -1, 0, +1, ... . The transmission for a mask with d/D ˜ 0.4, similar to the ratio in the experiment, is plotted in Fig. 2 for various sxß /(d/2). Figure 2 shows that for sxß /(d/2)= 0.01 the shadow closely follows the mask shape and the bunches are well formed. For sxß /(d/2)= 0.1 the gap between the bunches starts filling up, while for sxß /(d/2) = 0.5 the bunch train charge distribution becomes continuous. Figure 2. Plot of the beam transmission through the mask (as described by Eq.1 ) with normalized parameters d/D ˜0.4 as function of the position (corresponding to energy in a dispersive region) of the beam for various ratios of betatron transverse size sß to mask wire diameter sß /(d/2)= 0.01 (red line); 0.1 (green line); 0.5 (blue line); 0.75 (black line, similar to parameters in ), and 1.0 (pink line). 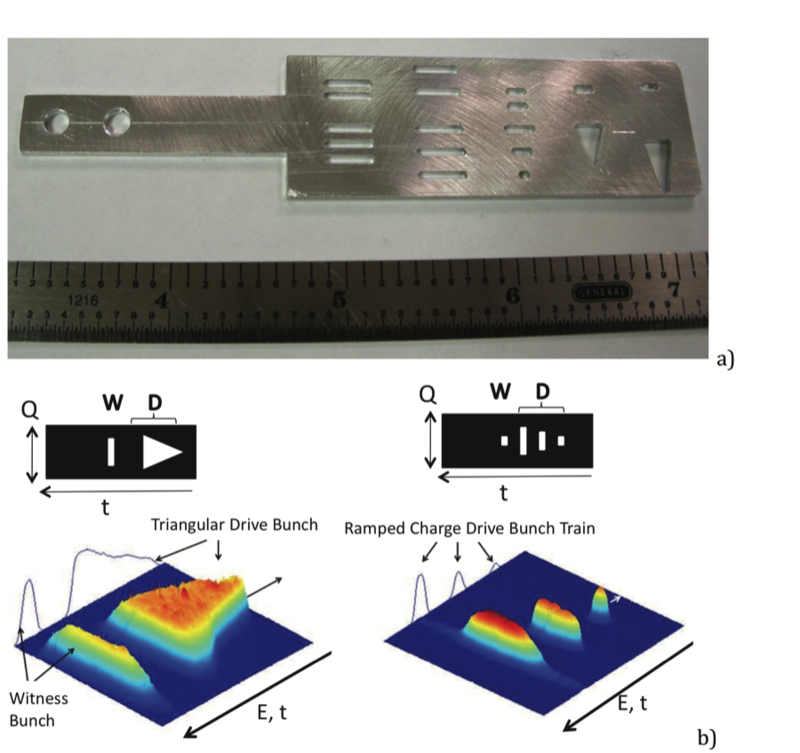 The wires are indicated by shaded regions and the letter W.
Interferometric measurements of coherent transition radiation (CTR) confirm the occurrence of the micro-bunch train with less than 1 ps spacing between bunches (Figure 3) . This method can be implemented in any particle accelerator that includes a magnetic chicane or dog-leg arrangement. It also can be used in conjunction with magnetic compression to produce trains of even shorter electron micro-bunches. At the ATF, this method is extensively used in PWFA user experiments. Figure 3. 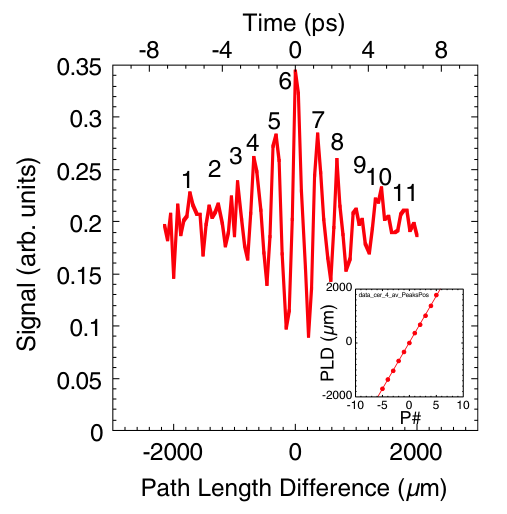 CTR interferometer trace for the mask with d = 500 µm and D = 1.27 mm. The distance between the peaks is determined from a linear fit of the measured path length difference (PLD) versus peak number (P#) shown in the inset for the 11 peaks (six bunches). The slope of the curve and therefore the distance between bunches is about 344 µm. Later, the electron bunch masking technique at ATF was developed with more complicated mask profiles to produce shaped bunches , see Figure 4. Muggli, P., et al., Simple method for generating adjustable trains of picosecond electron bunches. Physical Review Special Topics-Accelerators and Beams, 2010. 13(5): p. 052803.